April 06, 2019:The state government body, MBOSE, officially conducted the Class 10 exams during the month of March. This year the Meghalaya class 10 (SSLC) exams will begin from 1 March, 2019 and continue till 18 March 2019. The MBOSE conducts the Higher Secondary School Leaving Certificate examination (HSSLC) during the month of March. For this year, the Meghalaya HSSLC exam will be held from 1 March to 25 March. 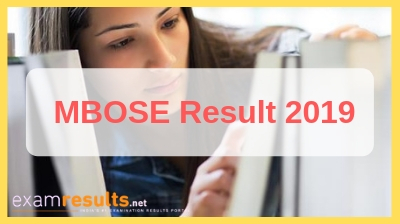 Keep visiting this website for regular updates on MBOSE Class 10 results, MBOSE Class 12 results 2019, MBOSE Class 10 sample paper, MBOSE Class 12 sample paper, Meghalaya Class 10 Time Table 2019 and Meghalaya Class 12 Time Table 2019. The MBOSE SSLC results were declared in the month of May in the last 2 consecutive years, in 2016 it was declared on 25 May and in 2017, it was declared on 23 May. Going by the trend, MBOSE SSLC results 2019 will be declared on 25th May this year. Where Else To Check Meghalaya MBOSE Exam Result 2019? Bookmark this page (CTRL+D) for future reference. All the best! The Meghalaya Board of School Education was setup as per the 1973 MBOSE Act. The board controls, regulates and look after the matters associated with school education in the state of Meghalaya. It also conducts examinations for secondary school leaving certificate for students. The Meghalaya education board also provides regular as well as distance education to the students from class 8th to 12th for the schools that are affiliated to MBOSE.